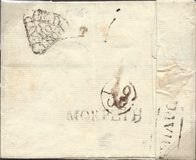 1751 Entire addressed to Paris from Battersea showing on the reverse a fine Southwark Office Dockwra for 'PENNY POST PAID/S/MO', L354. Prepaid charge of 1d at the Southwark Office and to pay on arrival 10 Sous. A Very Rare usage of a Dockwra to overseas. 1706 Entire addressed to Chelsea showing a Type 2A General Office Dockwra for 'PAYD/PENY/POST/G/TH', L 356, in black. 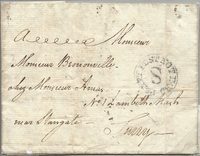 1793 Privately carried entire from Cirensce, Italy to London (Surrey), unpaid at the Southwark Office with, on the front, a fine 'S/PENNY POST NOT PAID in circle, L 392. 1780 Entire from Essex Street addressed to Charlton, Kent, showing on the front a fine SOUTHWARK OFFICE CIRCULAR 'PENNY POST NOT PAID/S', L 392. 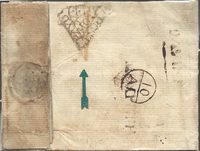 1752 Cover to Charterhouse, London, showing a Type 3a St Paul's Office Dockwra for 'P/FR', L 347. Manuscript Receiver 'Bramley'? 1741 Cover to Westminster showing a Type 3c SOUTHWARK OFFICE DOCKWRA with INVERTED CENTRE variety, L 325c. Very Scarce! Manuscript Receiver "Farrant". 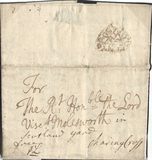 1760 Entire addressed to "The Foundling Hospital" showing on the reverse a fine Type IV Westminster Office Dockwra for PENNY/POST/PAID/W/SA, L 363. 1783 Entire to "Kingsinton Gore" - Kensington Gore - showing a very fine TYPE 4 HERMITAGE DOCKWRA FOR "PENNY/POST/PAID/H/TU", L 343. Manuscript Receiver "Jackson". 1770 Entire from Wimbledon addressed to "The Foundling Hospital", London showing a very fine Type 4 Southwark Dockwra for 'S/FR', L 354. Circa 1770 General Office Dockwra for 'PENNY/POST/PAID/G/WE', L 336, together with a Temple Office 5 o'clock time stamp, L 366. There is also a manuscript Receiver "PARR". 1784 Entire to Primrose Streeet, Bishopsgate, showing a fine Type 4 HERMITAGE DOCKWRA FOR "PENNY POST/PAID/H/FR", L 343. Manuscript Receiver "Sanders". 1776 Entire to London showing a very fine General Office circular "PENNY POST NOT PAID/G" in black, L390. 1760 Entire addressed to Haymarket showing on the reverse a light but fine strike of the Type 4 Westminster Office Dockwra for 'W/TH', L 363. 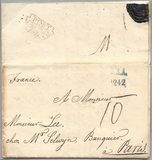 1752 Local Cover to London showing on the reverse a fair ST PAULS Office Dockwra, Type 3A, for 'P/MON', L 347. MS Receiver "Payne".